In Vienna, Abbot and Costello wouldn’t have been talking baseball (see video below) in their classic “Who’s on First?” skit, they would have been discussing floors. No, the Viennese aren’t trying to have a little fun by putting one over on their foreign guests. (Though it is amusing the first time you witness an ignorant out-of-towner boldly, athletically, opting to take the stairs only to realize four floors up that the third floor is actually maybe the fourth, fifth or even the sixth). Yes, the Viennese were being creative with their numbers long before it became fashionable on a worldwide scale to do so. When the Vienna Building Ordinance stipulates (as it has for centuries) that no resident buildings within the so-called “Gürtel” (districts 1 -9) be taller than 5 floors – no problem. Start your building with a ground floor (Erdgeschoss). Maybe add a Mezzazin, Hochparterre or Belle-Etage and go from there to the first floor. What? A Mezzazin is supposed to be a half-floor, you say? No worries. No one’s checking. As long as the top floor is the 5th, all is good in the Empire. In the Republic. In the inner districts. For goodness sake, even the Vienna City Hall has a Mezzazin. Despite Viennese finesse for creative solutions, the city has indeed managed to keep the building heights within the inner districts low and thus maintain a beautiful old town skyline for centuries. Now that’s good city planning. And precisely the reason why you have to get yourself down to the Rathaus before March 8th. Because right now you can ascend the “City Skyliner Gondel” — a temporary tower –erected beside the Vienna City Hall (Rathaus) in honor of the Ringstrasse’s 150th anniversary and the 20th Anniversary of the Vienna Ice Dream (Eistraum) Skating Rink at the City Hall. Yes, the UFO-looking contraption has caused a fuss among some fun-spoiling Viennese sour grapes steadfast in their century-old ordinances (I would expect nothing less) but they’ve had their turn. Now it’s yours to enjoy a good view of this beautiful city. Go now while the winter sun is shining and don’t miss the limited opportunity (until March 8th!) 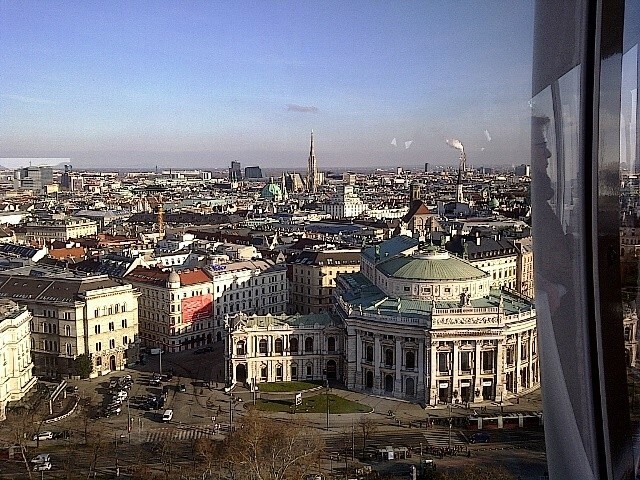 to pay your 7 € (kids pay 4 €) and boogie on up the 81 meter high tower (you’ll be up 60 m high) that will offer you a slowly turning, 360 degree panorama view of Vienna. Buy a drink at the stand while waiting in line and take it up with you. No problem. The queue moves quickly (60 people per trip fit in) and the trip up lasts 7 minutes (one minute up, 5 minutes turning, one minute down). All seats are good because the tower turns and everyone ends up standing up anyway. 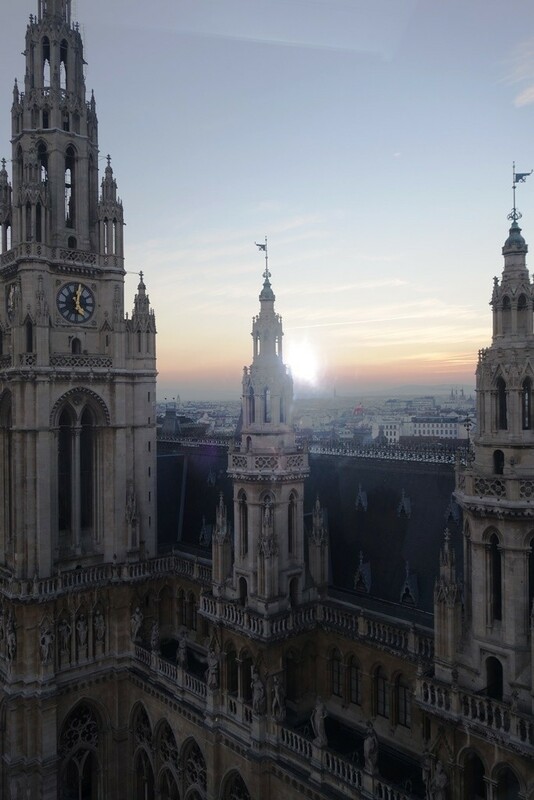 Give a shout out to the little Rathaus man on top of the Rathaus. Maybe he’ll wave back. (In which case, don’t opt for the alcoholic beverage next time you go up). How to get there: Subway U2 to Rathaus or to Schottentor and walk over or take trams 1, D or 71.